The online environment has changed dramatically in the last two years. But most sites haven’t. And most site owners are still following the conventional, rehashed wisdom of a gazillion shiny new and me too posts telling them what they need to have on their site to be successful. It’s time to rethink all that. It’s time to re-evaluate your site using real data from real tests in the real world. It’s time to revamp your site for success using current standards, not advice from two years ago. We are in the year of mobile now. Going mobile with your site is more than getting a fully responsive theme. Both affect your bounce rate, time on site, and most importantly, your conversion. And now Google is scoring, and giving perks for mobile-friendly sites. 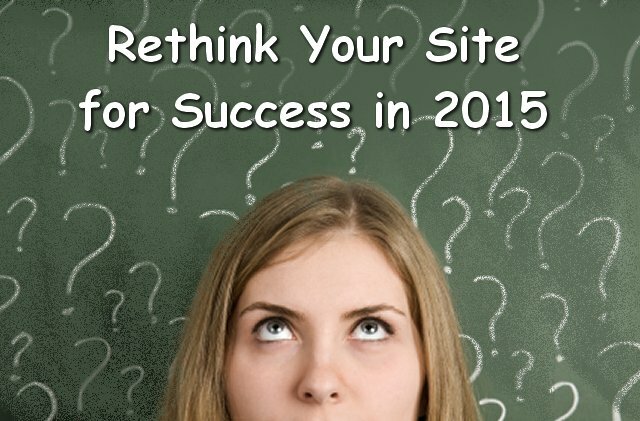 It’s time to throw out the old ways and rethink your site for mobile success. If you’ve been trying every new shiny thing the gurus tell you to use, I guarantee the back side of your site is a mess. It’s affecting both speed and security. I see it every day in Site Audits. 3GB of junk – that’s what I typically remove from sites that are 5+ years old. That’s the equivalent of 3 more sites! Mobile users have slower connections. Faster page load matters. Faster sites and databases make that happen. Some plugin types chew up the CPU, memory, and bandwidth on your hosting account. If you’re on shared hosting, you’ve got a real limit of these resources. Use them wisely. Hosting companies routinely limit site availability due to resource overages. When was the last time you even logged into your hosting control panel to see your resource meters? Yep, there’s a plugin to check your plugins. It will show you which plugins are slowing down load time. What you won’t see with this plugin checker is what all those plugins may be doing to your database. Plugins with logs are the worst offenders. Many come with these logs turned on by default. You probably don’t even check them. Heck, you may not even know they exist. But, they’re killing your database! Turn the logs off. Any plugin or function that pulls data from an external source can become both a performance and security risk. It may seem like a good idea to pull resources from the cloud, but it isn’t always. Anything from the outside world could be tampered with. And you’ve given an open door for that tampering to enter your site and hosting account, and even potentially attack the host server. Outside resources don’t always run faster either. If the servers or network where the resource is stored is under attack, they will be running slow. That means your pages have to wait on that data to finish loading. The Internet runs on wires. And those wires run through hubs, much like airline traffic does. When a hub has a problem, so does your site delivery speed. Any resource from the outside that has to go through a slow hub is going to slow down your page load speed. YouTube – yeah, good for you. What’s the bandwidth to the end user on a cell phone? WebPage Test is my favorite testing tool to see the origin of all of the requests being made when a page loads. Want to know how to run your own tests and what to look for? Check out the video tutorials in Level 4 of my Webmaster Training program. On a fully responsive theme, you have to scroll way past a blog post to see anything in the sidebar widgets. Look at all the conversion you’re missing with just those three! RSS-to-email delivery of your posts miss all of those conversion points too. As much as you may hate the idea of ads in your posts, you’re going to have to start rethinking that in light of how much more you miss the revenue on your conversion points. You don’t have to put ugly banners in the middle of your posts. Fancy formatting – try blockquote or horizontal lines to set off some text to draw visual interest. A CTA that looks like a post image – scroll down the blog archive page on +Ana Hoffman’s superb Traffic Generation Cafe site. Did you see the conversion ad? Try again. See it yet? Here’s a hint. It’s the second one down. Natural flow CTA – here’s another example from Ana. Check out any of her Weekly Marketing Skinny posts. Here’s one. The CTA’s are right there in the middle of the post. All related posts plugins have issues. They are either resource hogs, or pull info from the outside world. Those are performance and security issues. Read Do Related Posts Really Decrease Bounce Rate for a whole host of reasons why they are not effective anymore. Instead of any related post plugin, consider using more links in the content itself to your other posts, just like I did in the paragraph above. +Denise Wakeman says she’s been making a point to do more of this and it’s working. Google loves it – Intra-links are indexed by Google. And it gives the links context and relevance. It’s natural – there are no ads, no CTAs, and no disruption to your post narrative. +David Kutcher has a new experiment going where he manually includes related posts at the end of each post with a Read More link. I nudged him into sharing the results. Follow him for more. He’s good that way. If you don’t have one at the end of your posts, get one. It will be the next thing seen at the bottom of your post. Put your CTAs in it, like social media links and your newsletter opt-in. Did you know that the WordPress SEO plugin by Yoast has a nice little anti-scraping feature that can be used for better conversion too? It was designed to put a little message with rel=canonical links back to the original post. So, if a scraper took your feed and auto-posted your blog to their site, the link would go with it, credit you as the author, and point back to the original post on your site. Well, that little thing can take HTML code too, which means more links. Dress it out like your Author Resource Box above. Get more clicks from blog post subscribers. And another little trick. Show only a summary in your feed. That way folks have to visit your site to read the rest. There are three types of mobile themes: Fully responsive, mobile optimized, mobile friendly. BlogAid is a hybrid of the last two. It retains its shape but reduces in size for the screen, at least the content area does. There are multiple elements that have to change, like some special page templates and such. So, I’ll be taking this revamp in segments. And I’ll be posting about the changes as I go including the what and the why and the result I expect. Make sure you don’t miss a post. Subscribe to the RSS feed.